QAM is one of those terms you’ll find yourself faced with, if you hang around commercial TV installers enough. They pronounce it “kwam,” as if it had a “u” between the first and second letters. QAM is a tough concept to really wrap your head around, so I’ll try to explain it simply in a way that maybe helps you understand. If you’re looking for fancy math, there are plenty of other articles. This one is for the novices. It’s been over 150 years since scientists discovered that you can intentionally send really weak bits of electricity through the air. A few years after radio waves were invented (yes radio waves are really weak bits of electricity) someone tried to figure out what do do with them. The waves were too weak to power anything, but folks like Lee DeForest knew they could be used for something. There are several different characteristics of radio waves that make them useful. Most importantly, a radio wave stays consistent. If you “format” it one way and send it through the air, it will stay “formatted” that way when it’s received. The same is true if you send it down a wire. Radio signals can be more than just “weak” or “strong.” The number and size of waves can be changed. We call this “frequency” and “wavelength.” The waves themselves can be changed around. You can make some taller and some shorter. We call that “amplitude modulation.” You can make some wider and some narrower. We call that “frequency modulation.” If you put a signal together so it looks like a sound wave, you can turn it into a sound wave when it’s received. That’s what makes radio possible. Of course, it’s more than just radio. It’s TV, satellite, cell phones, pretty much everything in our modern world. When we take those signals and format them in a really fancy way, we can fit dozens of channels of television. Cable TV started out as a way for people to get channels they couldn’t get due to trees or obstructions. By the 1990s there were about 100 national channels and that number kept going up. Unfortunately there’s a limit to how much “space” you have on a cable. There’s room for about 50 channels if you use the same method you use for an antenna. Beyond that you’re dealing with a really wide range of frequencies and that causes problems. By the mid-1980s cable operators had run out of space. They needed a solution, and they turned to higher math. Enter QAM. AM and FM, as I pointed out above, are pretty easy to understand. The changes happen across one axis while the other remains stable. Take a look at this GIF. In an AM signal, the wavelength stays the same while the waves get taller. In an FM signal the waves stay the same height while the wavelength changes. It’s very easy to understand that. Then, there’s QAM. QAM looks like this. Right around now you’re going, “huh?” So let’s back up. QAM stands for “quadrature amplitude modulation” and it describes a way of using two intermingled AM signals to create a 2D version of a signal. Both axes change at the same time. When you combine that with digital technology you get a very good way of representing ones and zeroes. QAM’s biggest benefit is that it’s compact. You can fit about 130 digital QAM channels over a cable and that makes it easier for the cable company to provide the channels you want. Using fancier technology like compression, you can do much more. Does QAM have to be digital? Does satellite TV use QAM? Does streaming video use it? 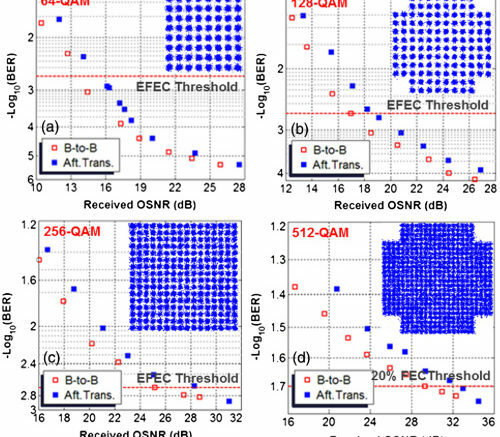 As weird as QAM seems, it’s nowhere near as complex as the technologies used for satellite transmissions. By using higher frequencies and fancier tuners, satellite gets thousands of channels to you. It also uses a technology called “PSK” (phase-shift keying) which is even harder to understand than QAM. As for streaming, it is pure digital data so it doesn’t have to be modulated like cable TV. However, QAM is not going away any time soon. Not only is it used in cable TV installations it’s also used in commercial TV systems. It’s a proven technology that seems weird to use, but it’s been around long enough that everyone knows how to use it.